Our steel garage kits are available in many sizes and styles to fit your uses, your environment, your budget – whatever your needs may be. We are nationally known for top-grade structures – often fitting right in, in places other buildings would simply not work. 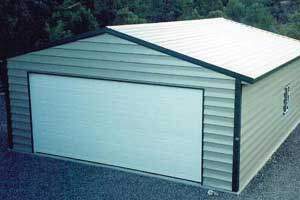 Our Sierra Series garages are designed in the tradition of conventional steel buildings, but also feature our “stand alone” frame system. This means that if you intend to cover the outside of your garage with materials other than our steel panels, this is the style to choose. Exterior steel panels are applied vertically (that is, with the panels’ formed ridges running vertically, rather than from side to side, as in other building styles). For secure attachment to your garage’s frame, steel cross-members are added to roof and side-wall frames. These are called “purlins” in the roof framing, and “girts” in the sidewalls. This enables you to install almost any sort of sidewall sheathing and exterior treatment you like – AND it results in an extremely durable building overall. Just one more plus to the purlin and girt system: it makes paneling installation easier and more “forgiving” than you’d experience with other systems. The Mohave Series garage is designed to give you the look of a traditional building, but in the most economical way possible. With engineering available for most all continental US areas, the Mohave Series gives you rugged durability along with economic practicality. 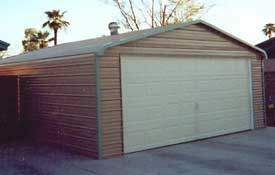 The Mohave steel garage has the same eave profile and vertical roof as the Sierra style described above, but side wall paneling applied horizontally – assembly is fast, simple and straightforward. The Teton Series garage is designed to integrate into the urban environment, with its 12” soffit eave overhangs and distinctive exterior paneling, replicating wood shiplap siding. This all-steel garage has the strength and maintenance-free characteristics of a modern metal building, with a distinctive residential appearance. The Teton’s heavy, 26-gauge paneling goes on horizontally, which means it’s a simple job from the ground up. Trim designs compliment and add dimension to the building’s distinctive profile. Available for delivery only in GA, FL, AL, MS, TN, & SC. 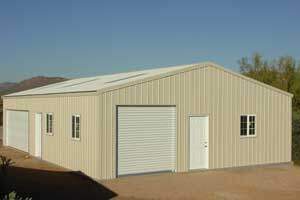 The Sonoran Series garage is the most economical and easiest to build of any of our metal buildings. This steel structure performs well in most any environment but is not recommended for areas having much in the way of snow loads – not because it won’t meet engineering requirements, but because the ribbed panels are applied in a horizontal fashion, which can inhibit the easy runoff of snow. The Sonoran can be used in urban or rural areas and is a great solution for utility storage, boats, cars, trucks or just general warehousing. This is the building that can begin serving you as a open carport, then later easily convert to a fully enclosed garage. The simplest to assemble of any building we offer, a beginner with limited tools and construction background will have no problems installing the Sonoran Series. 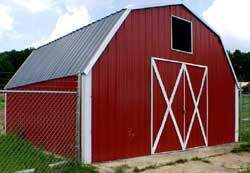 No other steel building company in America offers you the option of the gambrel barn style steel garage! The advantages of the gambrel are the same as those that led European farmers to come up with the design centuries ago: maximum interior space. With two different roof slopes inclining towards the peak, the volume of storage is quite amazing, regardless of the building’s outer perimeter. Taller door heights are available in the gambrel than in any of our other buildings. This makes it easy for the gambrel to accommodate the highest-profile RVs. Quite at home both on the farm or in the neighborhood, the gambrel by Absolute Steel has a straightforward panel application, whether you choose horizontal or vertical panels. And the frame is as simple to assemble as any of our other buildings. Click for floor plan ideas, more information, and pricing. Even Absolute Steel has to start somewhere, and this is exactly how we came up with every style of building we have — by asking someone to be our guinea pig! 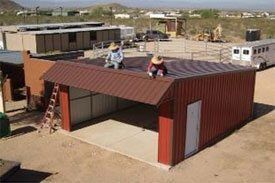 As a Maricopa garage “guinea pig” you will be one of the first to own a Maricopa saltbox style steel garage, and you’ll get a superlative product! Production of all your garage’s parts will be hands-on supervised by the owner and the general manager. Why? These will be the parts that jigs are set up from, for future production – so they will be “zero tolerance” parts, as close to perfect as we can possibly achieve. Assembly will be supervised by those same two people, and your garage will be professionally installed by our best crew. The Maricopa is only available on an “installed” basis because we will be photographing its installation for subsequent instruction books, and the finished building pictures will be featured in advertising. So you know we will make this a great example of our work! NOTE: Pricing on our Gambrel and Maricopa styles are not available online. Please call for pricing.